See, told you I’m addicted! 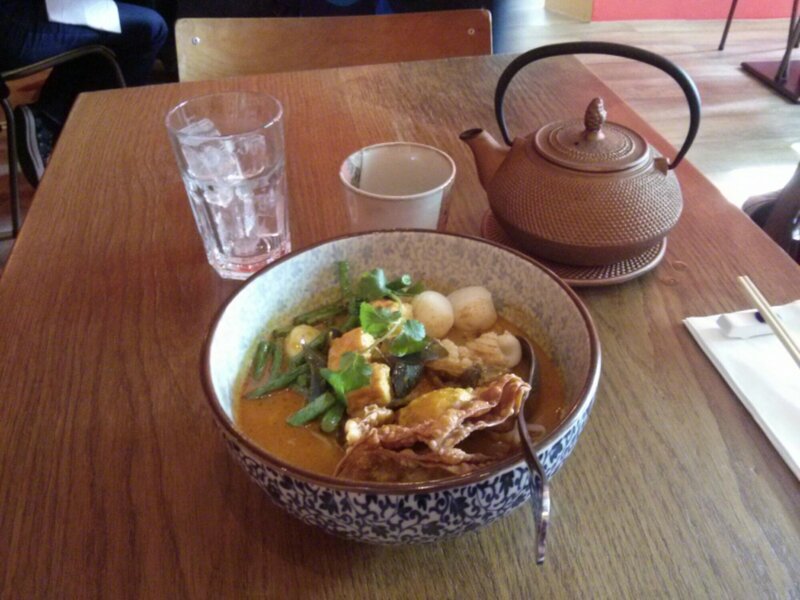 Yes, it’s laksa for lunch today. Was feeling a tad hungover and was head down bum up at work, non-stop till way past 1 o’clock. Thought I give myself a treat and went to checkout this joint just across the road from where I work. 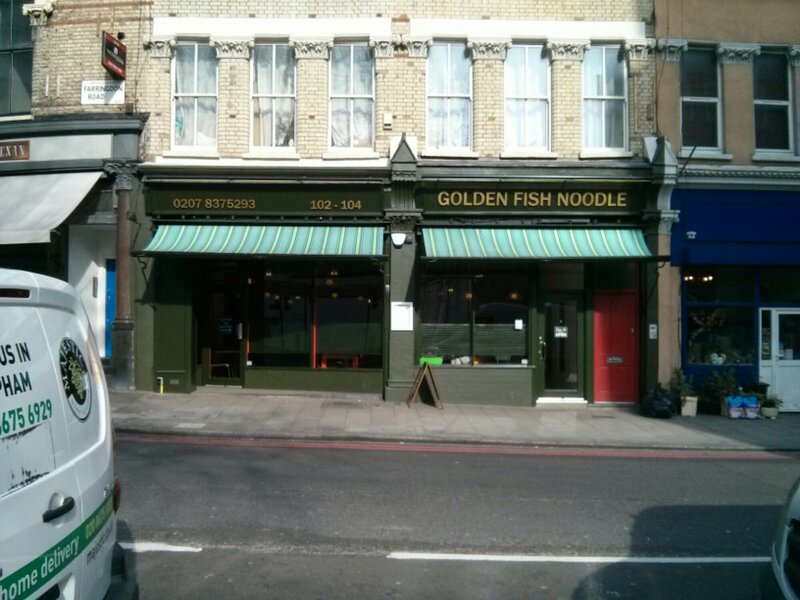 Golden Fish Noodles is located along Farringdon Road, across from Mount Pleasant and just next to Exmouth Market. I was intending to grab something from the food trucks in the market but most of the trucks had a long queue of customers and Junk just could not be arsed queueing up today. 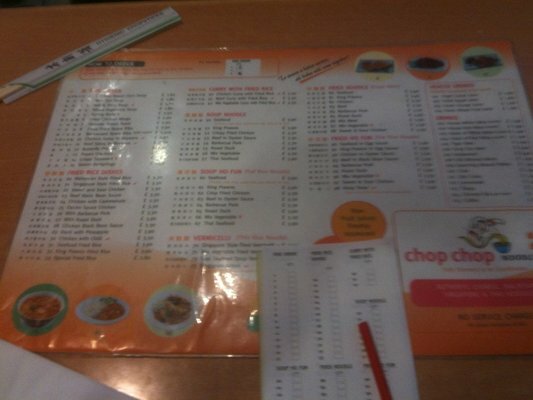 As you can see from the menu, definitely not as budget as Chop Chop but it won’t break the bank either. I really should force myself to try other stuff apart from laksa. Perhaps the Beef Ho Fun in a sauce or the Belachan Chicken Fried Rice can be my next target. Seeing I’m feeling a tad hungover, decided to be health and have tea instead of a soft drink. 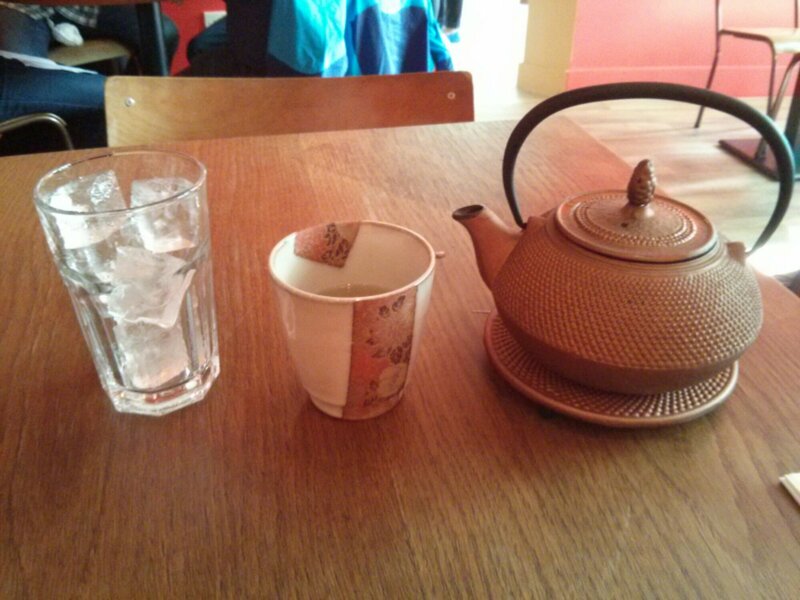 Ordered the “Iron” Guanyin tea. Also asked for a glass of ice on the side so I can make my own ice tea. 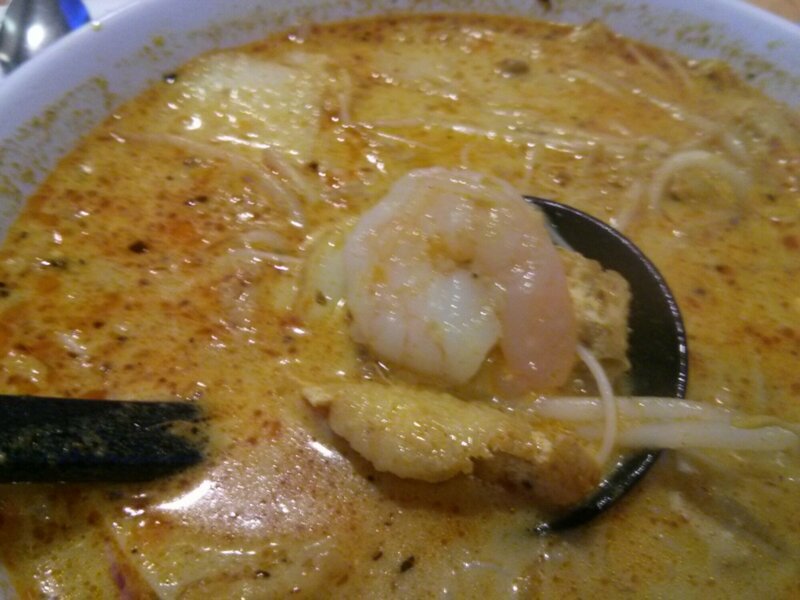 At £7.80 which is close to £3 more than the Chop Chop version, one would expect more ingredients in this Seafood Laksa. So there was 2 big deep fried prawn wonton, 3 fish balls (don’t laugh! ), 4 big slices of squid, quite a few cubed fried tofu, loads of green beans and bean sprouts in a thick and satisfying gravy laced with curry leaves. 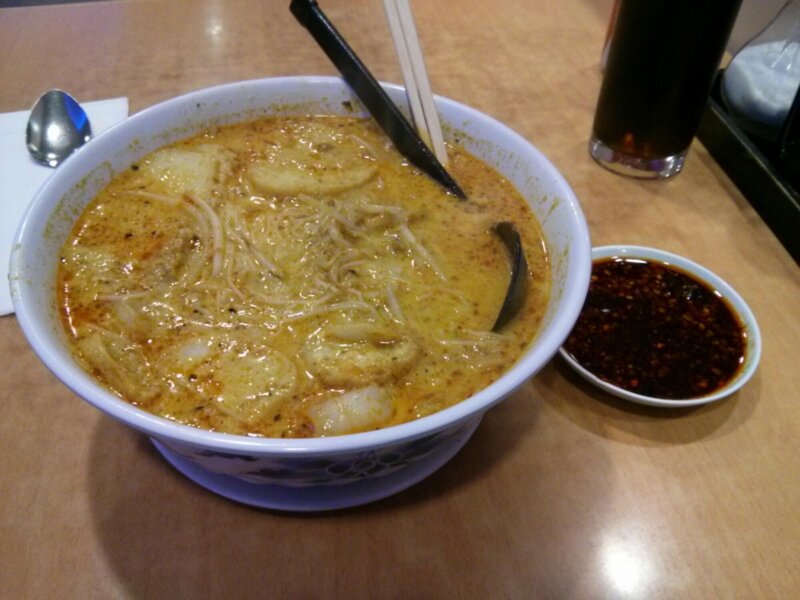 I’m glad they use thick egg noodles here instead of the more common rice vermicelli. 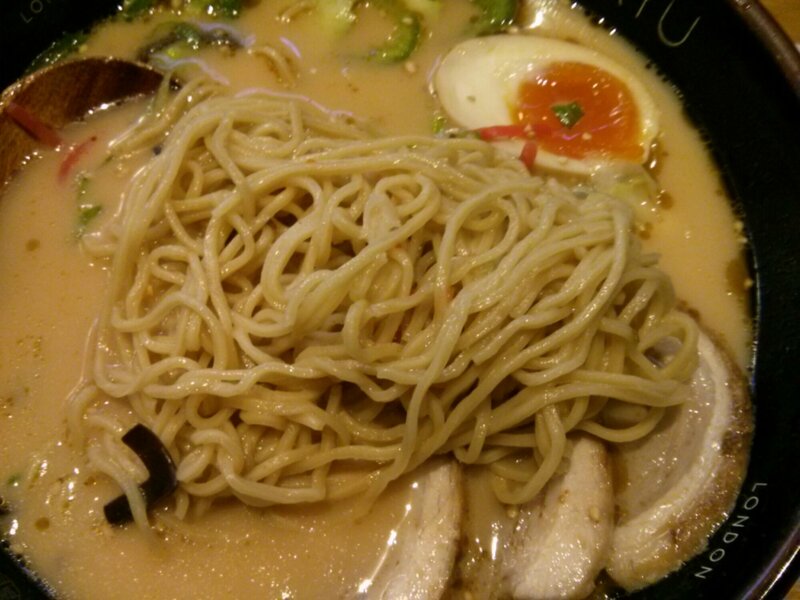 Though the noodles felt mushy, they were actually very well cooked with still a slice bounce. The only complain I have is I could do with more gravy and the spoon had a massive bowl which makes scooping out the gravy awkward. 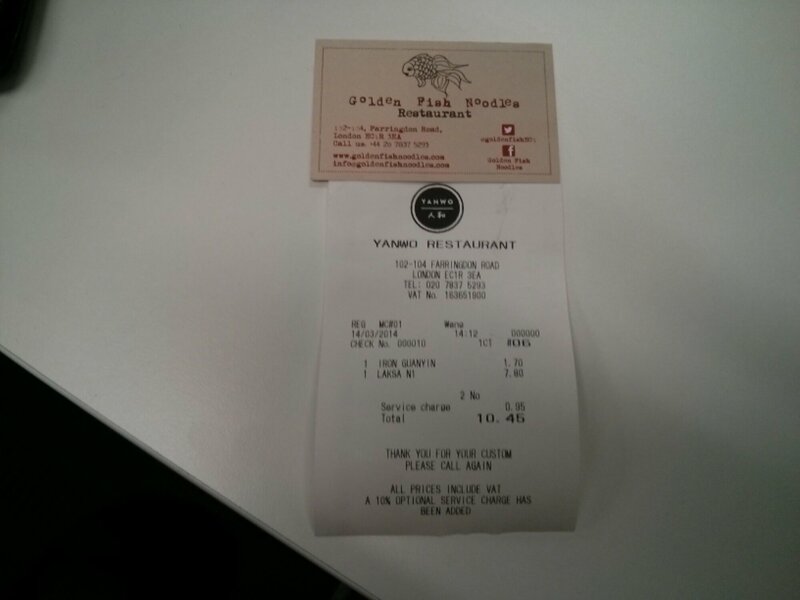 Hmmm… did not notice there was service charge added to the bill till later. I would not have tipped as generously as I had if I’d known. Then again, the service was very good. Both the waitresses were attentive and efficient. They really should reprogram the till to show the right business name soon. *Update: It would seem that my point about the restaurant reprogramming the till to match the restaurant’s name was partially accurate. 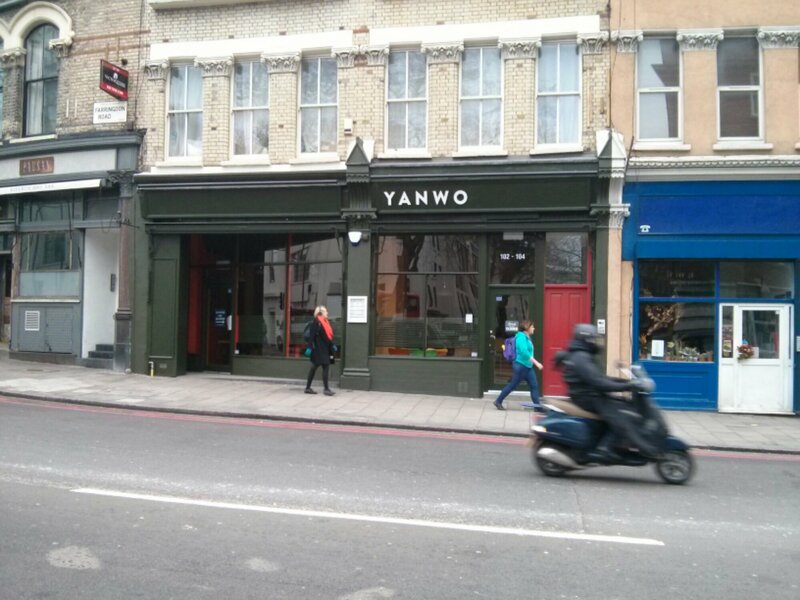 Walked by the joint today and noticed that it was no longer Golden Fish Noodles but Yanwo instead! Would seem like I visited in midst of a transition. Makes me feel like a revolutionary! Oh no! 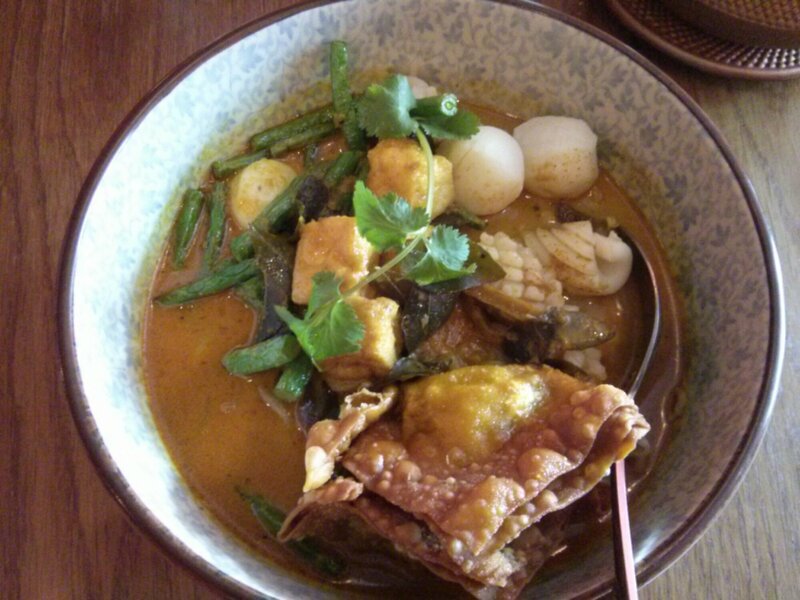 Not laksa again I hear you say? 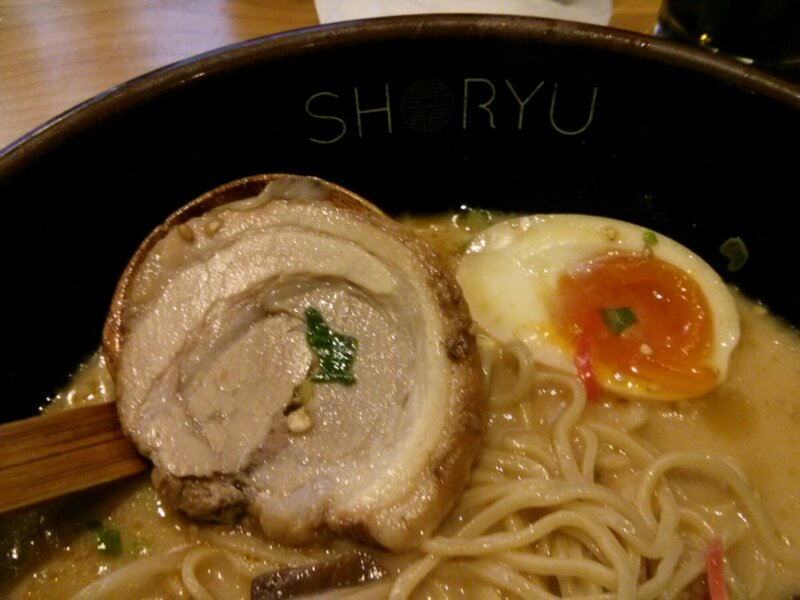 Yes, Junk is almost addicted to the stuff and this post and next will be about one of my all time fav dishes. 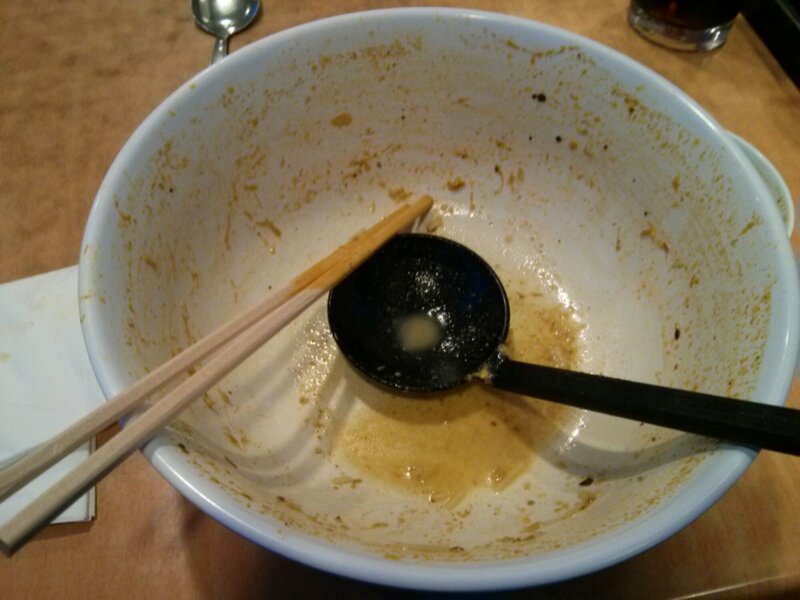 So one day last week towards the end of the working day, I found myself a tad hungry and could not get the ideal of having a big steaming bowl of laksa out of my head. Started looking around on Google maps for any potential to appease my craving. Lo and behold! 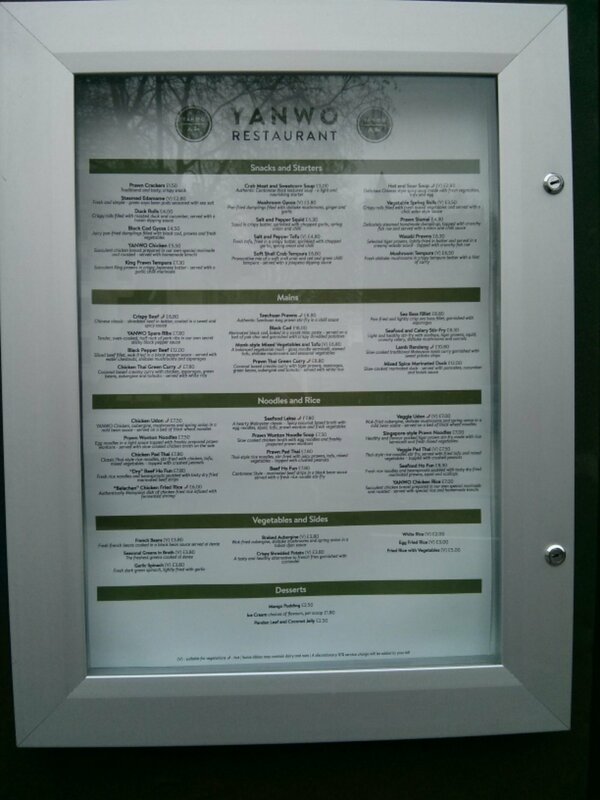 Found both Chop Chop and Hare and Tortoise outlets within walking distance from the office. 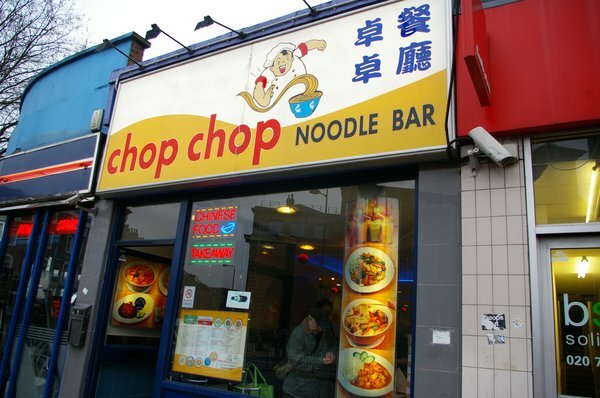 Chop Chop is a budget place serving a range of Asian/Chinese dishes. By budget, I really mean budget. One can have a starter, a drink and a main course easily under £10. Quality is not fantastic but portions are always generous.What the Boom might call, a reliable “Chew and Spew” joint. 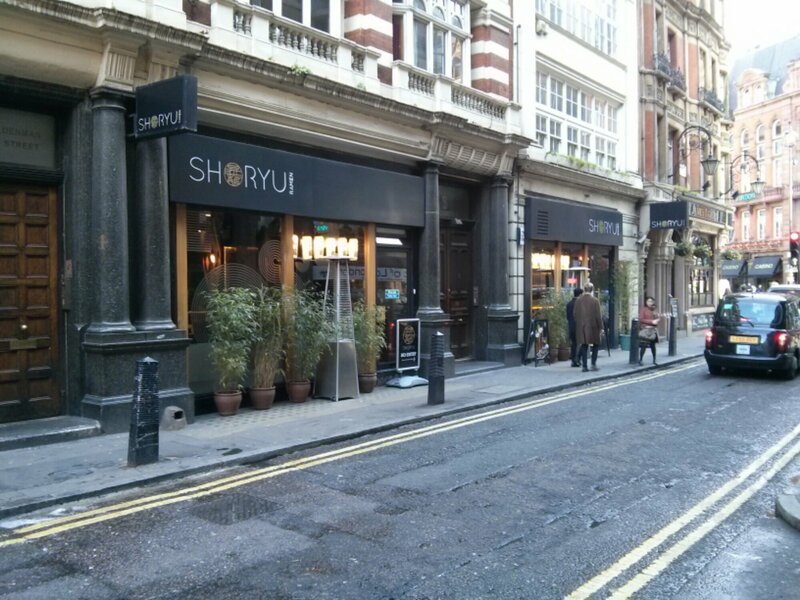 Apart from the outlet in Kings Cross, I know of one in Shepherd’s Bush and another near Fulham Broadway. There are many reviews complaining of rude or bad service which I have never encountered and I have visited all 3 outlets. Once you are seated, you will be given a pen and a marking sheet with numbers representing dishes on the menu. 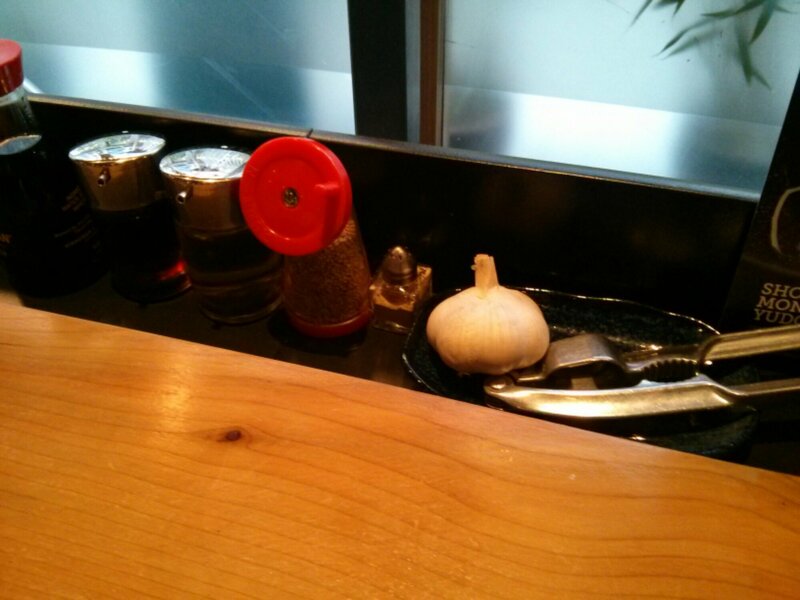 Simply indicate the number of portion of the selected dish on the marking sheet. 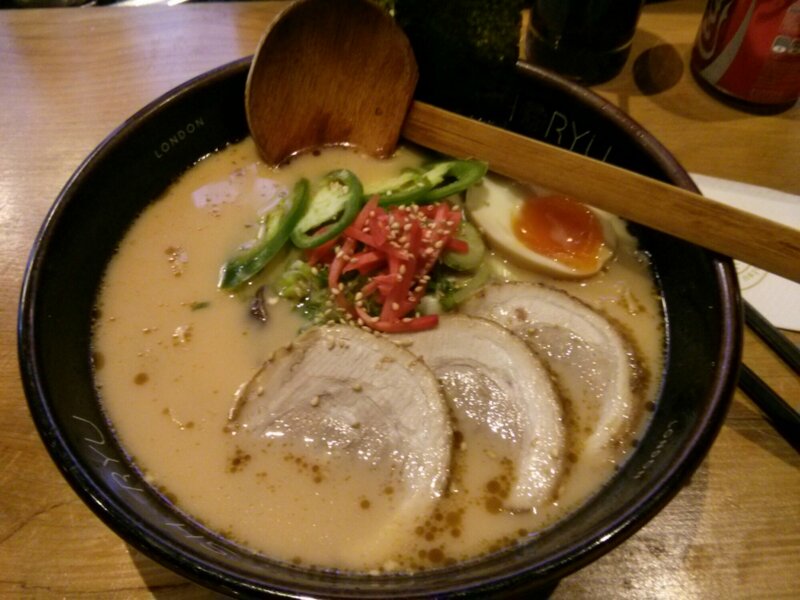 Of the umpteenth times I have eaten at Chop Chop, I have always told myself to try out some of their other dishes. 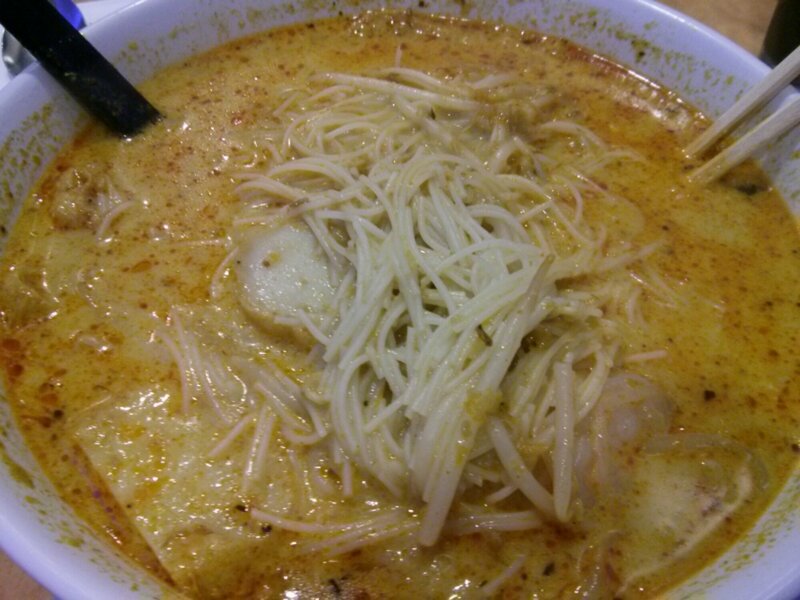 But I could never tear myself away from their Singapore Laksa, it’s simply one of my comfort dishes. 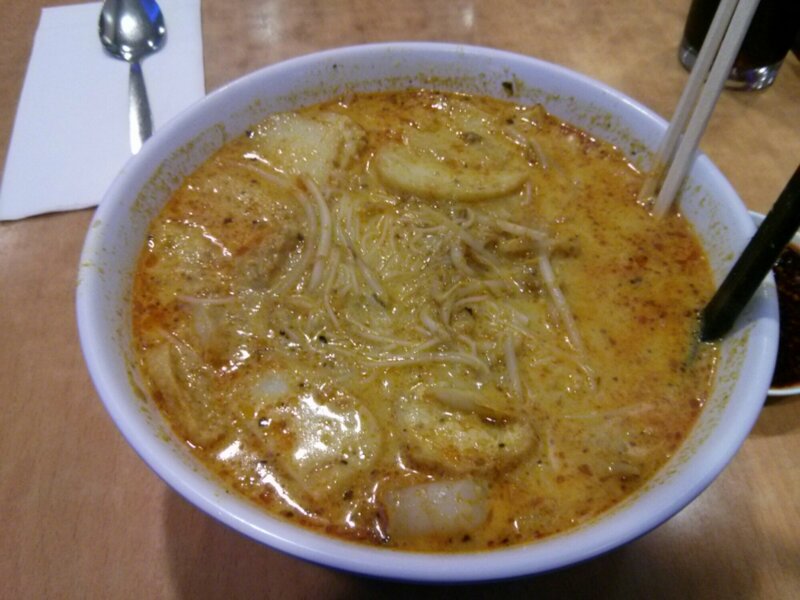 A bowl of Singapore Laksa at £4.90 (this have increased their prices over the years. I still remember when a bowl was only £3.90) will contain 3 good size prawns, maybe 5 thick slices of fish cake and a handful of fried tofu. 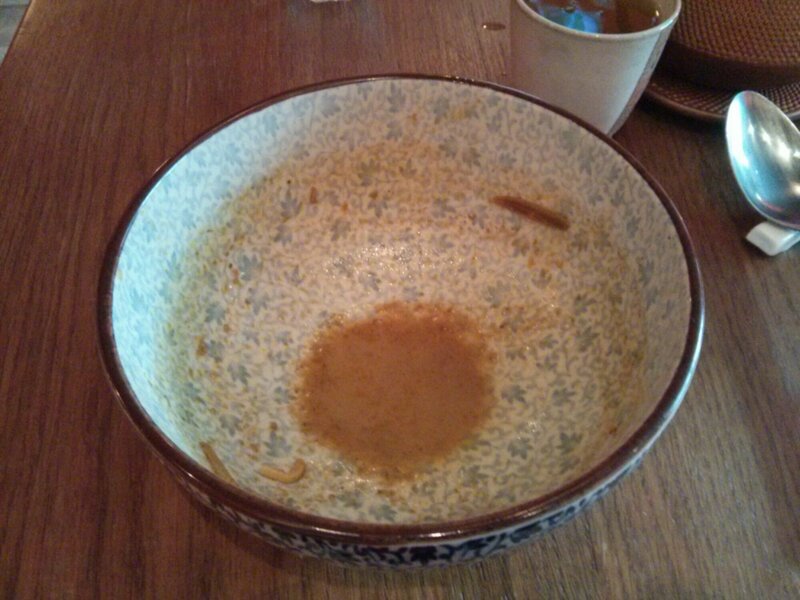 The small plate of chilli oil in the first picture cost 50p more. They use thin rice vermicelli here and believe me, the portion is huge! 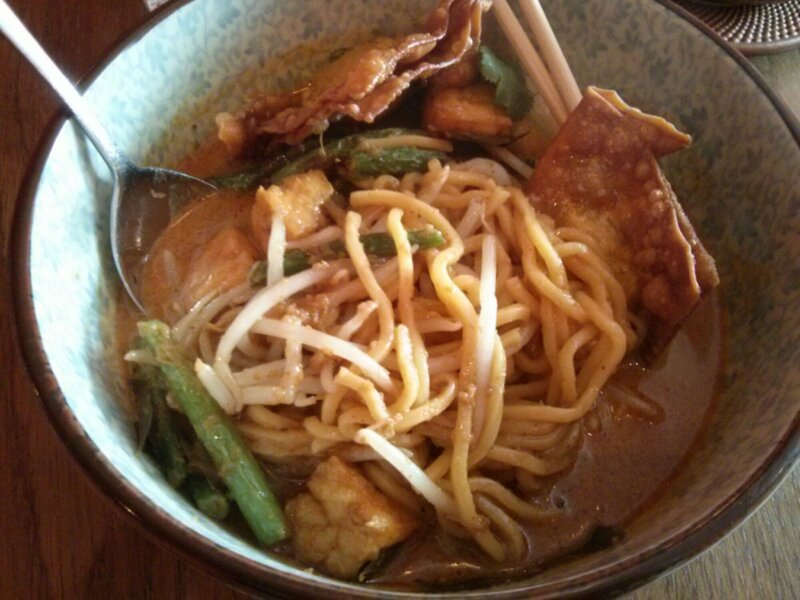 The rice noodles are accompanied by crunchy bean sprouts all drench in a spicy, rich coconut milk based sauce. Slurp, slurp, chew, slurp, there, all done! 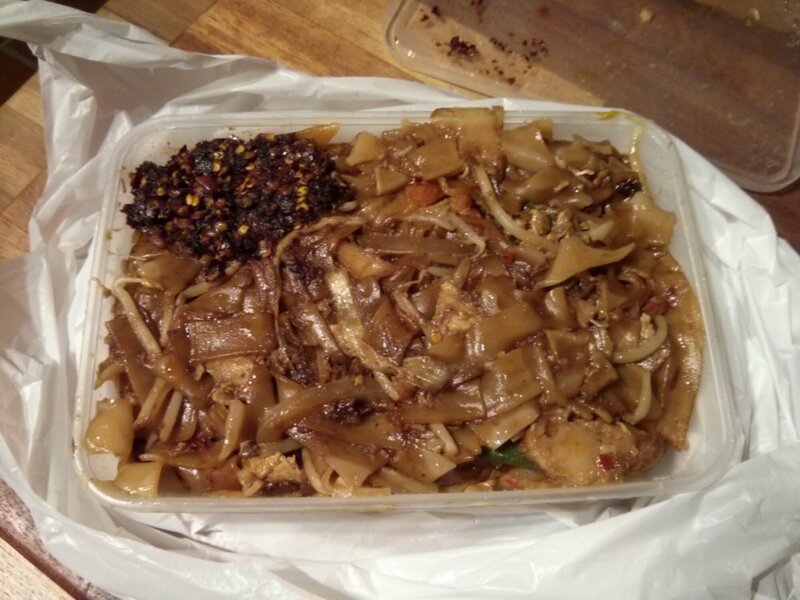 Also got a takeaway portion of Boom’s fav dish, the Kway Teow. This also cost £4.90 and I was intending to have it for lunch the next day as it was my WFH (work from home) day. Came the next morning, thought better of it and gave it to Boom for his dinner instead. What a nice person I am huh? 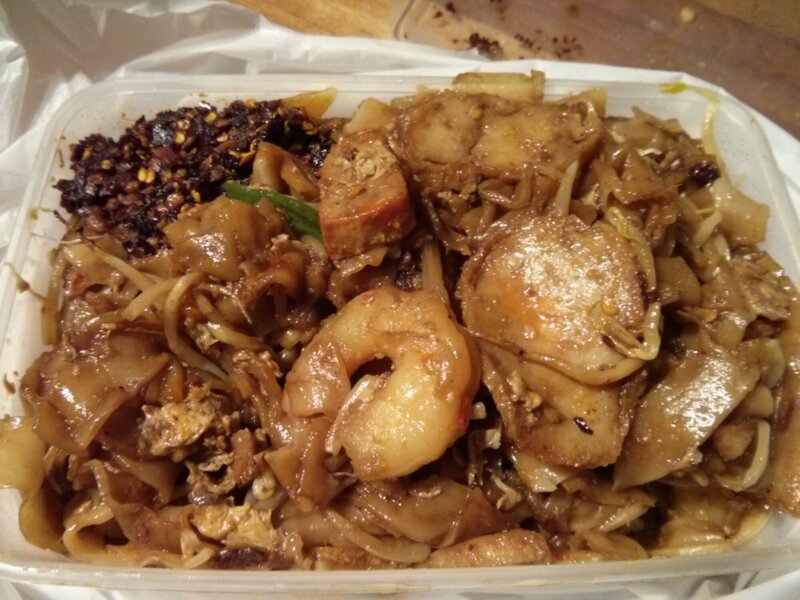 So the Kway Teow is quite rightly made with thick rice noodles, prawns, char siew, fish cake, bean sprouts all stir fried with dark soya sauce. Boom told me the next day that the Kway Teow was a perfect cure to his after drinks cravings and boy was the portion big he said. The Boom don’t lie. New location, new food adventures! For regular readers of my blog, sorry that I did not write much when I was based out at the Silicon Roundabout. I did have the aspiration to have a pho at every Vietnamese joint down by Kingsland Road but work and laziness got the better of me and I stopped after 3. Does not mean I did not eat lunch, just nothing worth much of a mention. Today’s write up is more out of astonishment then it being a taste sensation. For those not as bright a spark, the title of this post reveals what is in the neatly packed parcel which cost a whole £4! 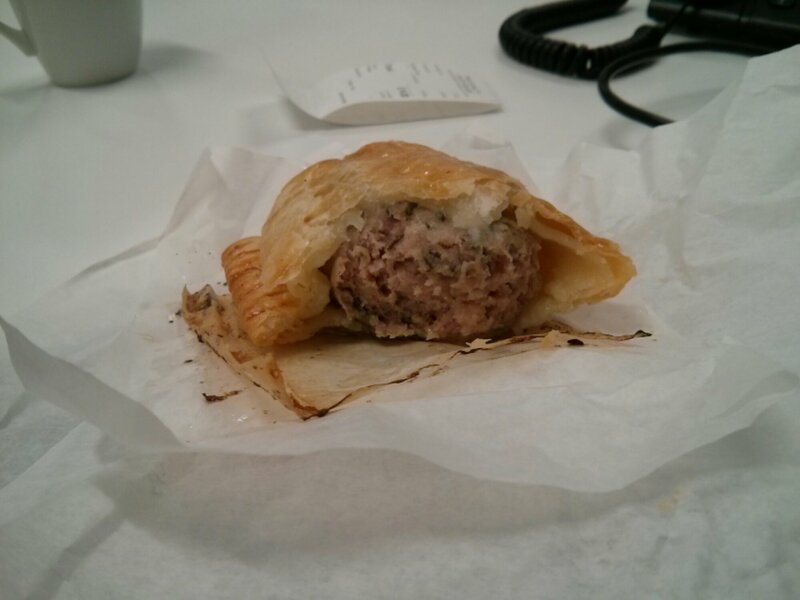 Yes, it’s a humble sausage roll. 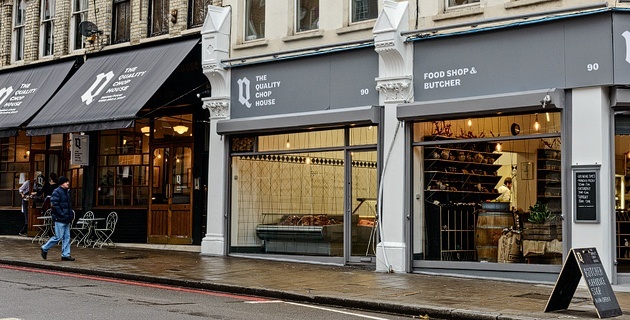 I know many critics simply loved The Quality Chop House. Rave reviews abundant. Just google for it. Without a buddy for a sit down meal, thought I give the offerings at the adjacent shop a try especially I was peckish for a snack after my lunch. 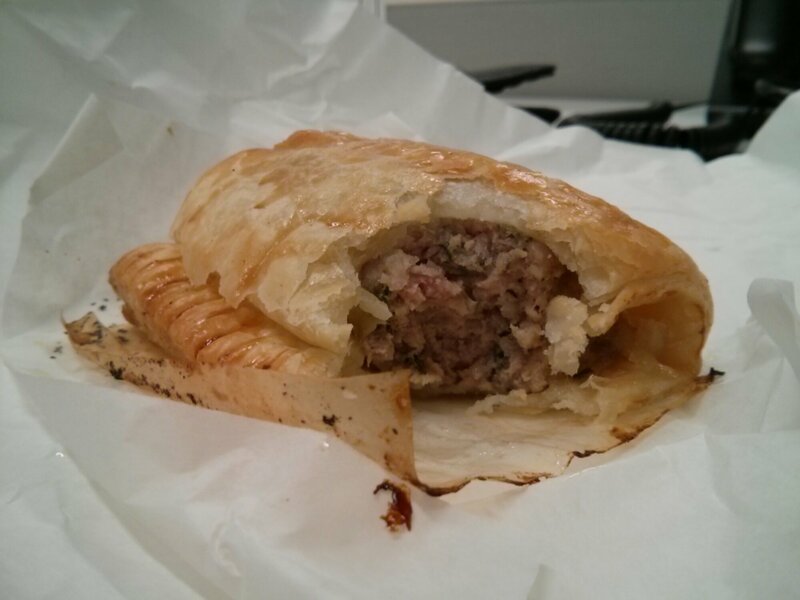 The big cuts of meat at the butcher looked promising and decided to give the sausage roll a go. Though there was no price listed, was expecting to pay say max £2.50 for a luxury version? Had to take a big gulp when I was told the damage was £4! 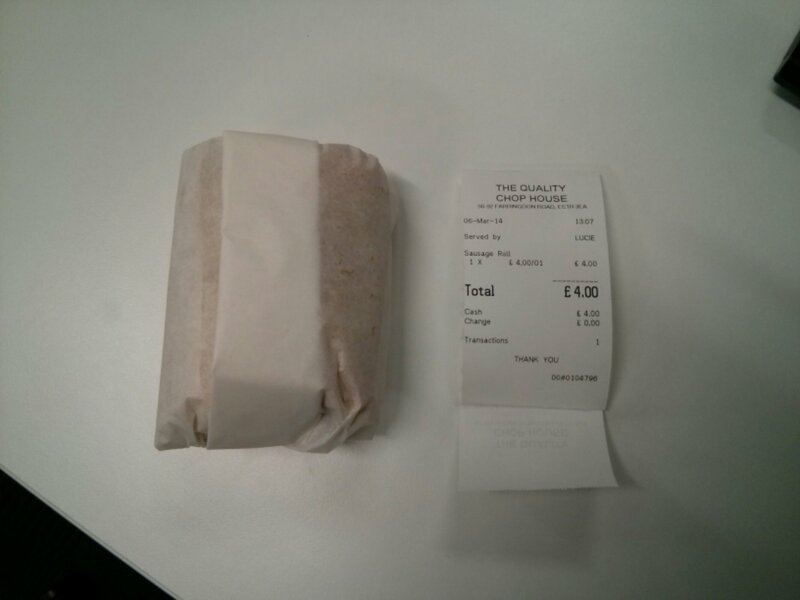 Four bl00dy f-fing pounds for a sausage roll! I kid you not, I got the receipt as proof! It’s not even a big sausage roll by any standard. The ones in Borough Market from The Ginger Pig were at least half a the size longer and were only £3 a piece I think. I usually use a packet of ciggies as the reference measure but don’t want to enrage the anti smokers lobby thus an Oyster card will do. 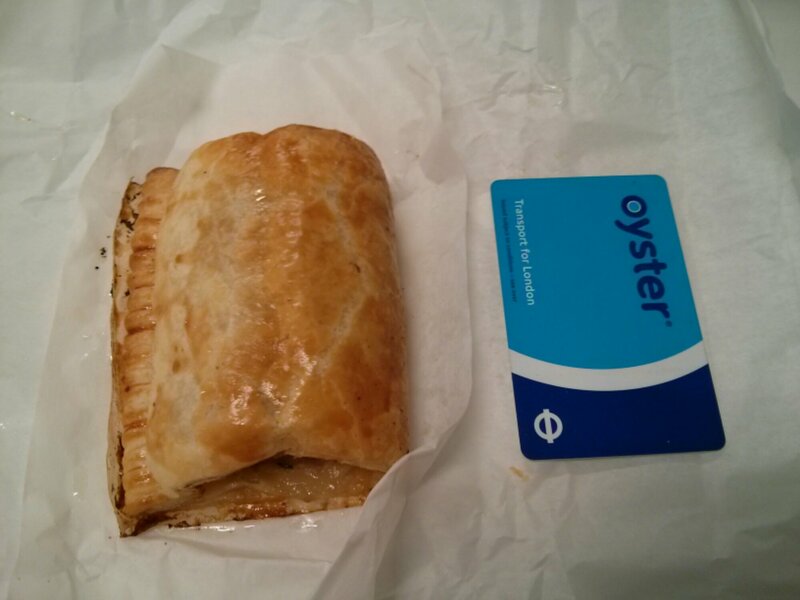 * An Oyster card is the size of a typical bank/credit card. You know what? 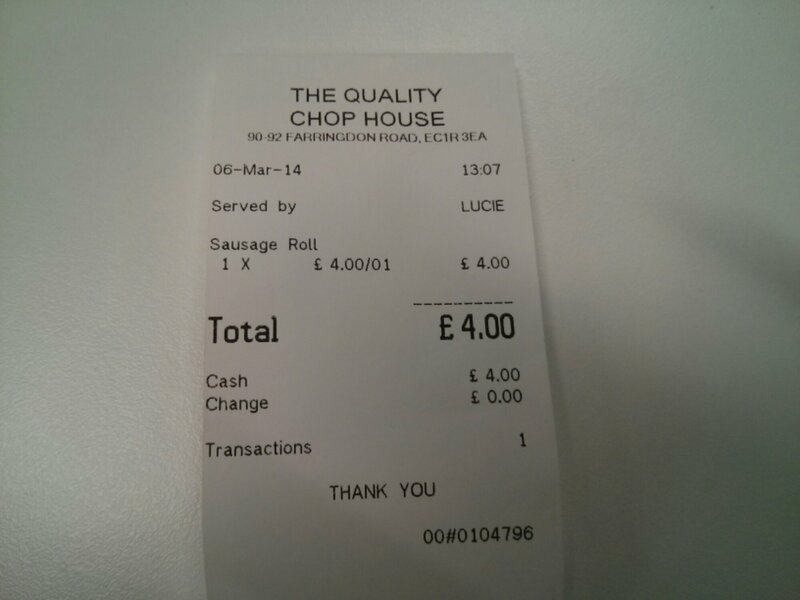 The taste of the sausage roll sure does not justify the price tag. Ok, it’s not a bad sausage roll, the puff pastry is light and flaky and the sausage meat filling was generous, juicy and well seasoned. Bits of green herbs were laced throughout the stuffing but for the life of me, I could not tell what the herbage was. Sage perhaps? Overall, a tad greasy but those of you health conscious peebs but still acceptable by my standards. But £4! I’m beginning to sound like a broken record. 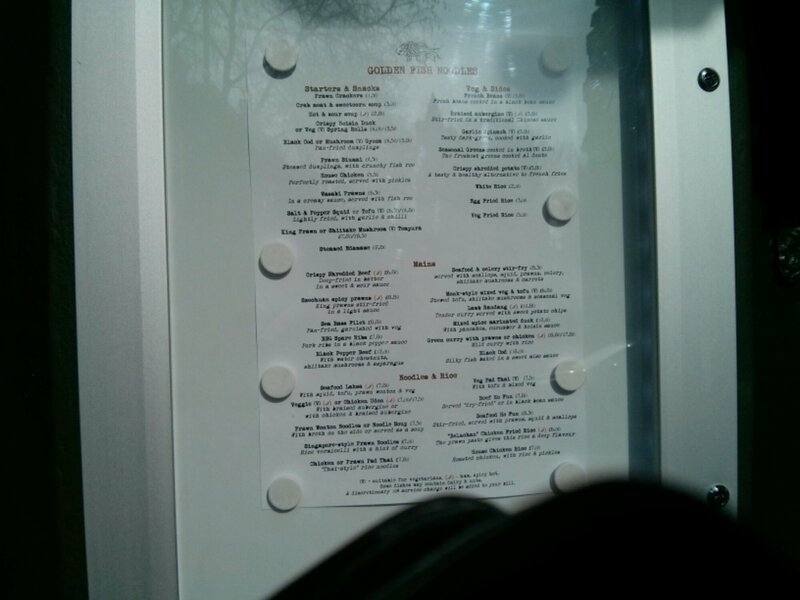 Especially when their lunch deal of a chop with a glass can be had at £15, something is wrong with their pricing. No wonder I was muttering under my breath on my walk back to the office cradling the warm £4 parcel.